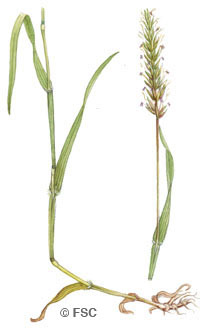 It is the first grass to flower in spring and has visible white hairs at the base of the leaves. This is a useful ID feature. It is found on 10-20 weeks dry soil per year and less than 10 weeks wet soil per year. It is very intolerant of waterlogged conditions. Sweet vernal grass contains coumarin; giving the smell of new hay when crushed. Chewing this grass gives a spicy sensation at the back of the throat.